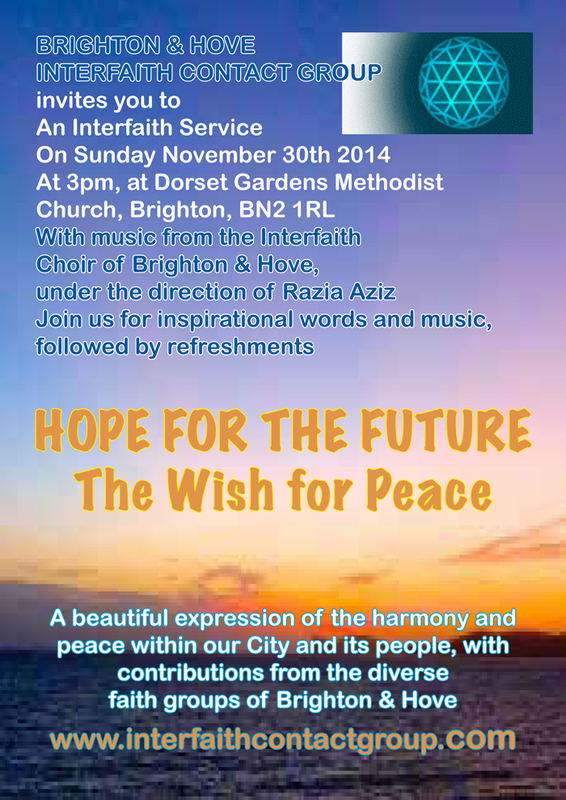 Yesterday I presented a reading at the Brighton and Hove Interfaith Contact Group’s interfaith service. I had been asked to read there about a month ago and was delighted that they were including Druidry and Paganism in their spectrum of spiritual paths. The Mayor of Brighton and Hove was there, Caroline Lucas (MP for Brighton Pavilion and former head of the Green Party), representatives from the Jewish, Islamic, Christian, Buddhist, Bahai and Hindu communities, and me. There was a mix of readings and music and it really was a roller coaster of an emotional journey. I think my favourite part was the Islamic prayer led by a Muslim from Turkey. He sang his prayer of devotion and, although I couldn’t understand the language he was singing, somehow I understood every word. It was unbridled love for his God, sung in freedom and with passion. As a musician who writes and sings music sacred to my tradition I completely got it. No wonder Cat Stevens, a deeply spiritual man, found his home there as Yusaf Islam. The theme of the service was A Hope for the Future – A Wish for Peace. My reading was towards the end and when my time arrived the leader of the service approached the microphone and said, “These meetings are always exciting. We have a Pagan next and I’m not even sure if he’s here.” I put my hand up in the air and was invited up to the lectern. The mic had been feeding back during some of the talks so as I approached she asked which mic I’d prefer. I said, “I’ll take this one – I love heavy metal so am not adverse to a little feedback”. Laughter from the gathering. I looked out at the politicians, the people of all faiths, and said how happy I was to be there, included in this meeting, and speaking for Druidry on the topic of peace. Then began my reading. Here it is for you to read. It really was a lovely afternoon, and the conversation after, over tea and cake, was inspirational. Peace. It’s a word whose meaning can be quite loaded. To some it can mean silence, meditation, the peace of the mountains and the forest. The word Druid means ‘one who has knowledge of the oak’, the forest sage. What could be more peaceful than that? But you will also have seen Druids on the front line back in the 90s at the road protests of Twyford Down and Newbury. You will have met Druids at the anti fracking protests in Balcombe and at Barton Moss. Druidry holds within it the peace of the Grove, the magic of the greenwood, but also of the peaceful protestor happy to stand up with civil disobedience for the things they hold dear. Modern Druidry traces its recent roots to the 1700s to a man called Edward Williams, better known by his Druid name of Iolo Morgannwg. His Druid Order had spend 15 years being beaten up by armed Tory vigilantes just for meeting, just for being Druids. They announced that they would be holding a circle in Pontypridd, at the rocking stone, they would be holding a Druid ceremony. Information was passed to them that the local Yeomans, with swords and guns would also be there, and that if they held their ceremony, they would be killed. But they met, bare footed and bare headed to show they were defenceless, and the words of the Gorsedd prayer were said for the very first time. And in the love of all existences, the love of God/Goddess/Spirit and of all goodness. The final line says, the love of all existences, and this included the line of horseman before them. This line of horseman turned, rode away, and never came back. In 1792, on Primrose Hill in London Iolo proclaimed the Gorsedd of Bards of the Island of Britain and said this prayer again. This later became the Welsh National Eisteddfod and the Gorsedd prayer is still spoken during the opening Druid ceremony to this day. So this radical blood still flows through the veins of modern Druidry with peaceful protest, moral resistance. When the Earth is facing such threats as fracking and global warming it would be incongruous if people who believed that the Earth is sacred were not there speaking on behalf of a planet, our home, who seems to have no voice among the corporate language spoken by most politicians. Yes, may there be peace throughout the whole world. And let that peace be given to all life, all existences. That story, which I heard many years ago now, is one key to why I hold onto the label Druid. I may be the most rubbish Druid in all pagandom, but that tension between pacifism and dissent, between activism and serenity, is at the core of my relationship with the path. Someone said to be the other day, if Druid means anything it means nothing. All the paths of interfaith have their fables, parables and myths. This is one of Druidry I hold most sacred. Me too Jayne! May those of us following the Druid path mindfully “walk our talk” in support of Love and Peace. So deeply profound … made me cry …. Wonderful to have been there and such inspiring words. The more Interfaith gatherings there are the more the ‘energy’ will spread and a time will come when peace will prevail. I truly believe that once all the faiths of this world find peace with each other there will finally be real peace on this planet. It is gatherings such as this that are making a start at that goal reachable. That was beautiful Damh, it made me fill up with pride to belong to such a wonderful path. That was very touching & beautiful Damh, im also very proud to be walking the pagan path. You all are such an inspiration to me.